If you ever wondered what a procedurally generated Contra game would be like if it were mixed with Left 4 Dead, DieselStormers is your answer. The roguelike action platformer from Black Forest Games had a successful crowdfunding campaign early last year, and now a brand new trailer has been released to show just how HELL YEAH it's going to be. 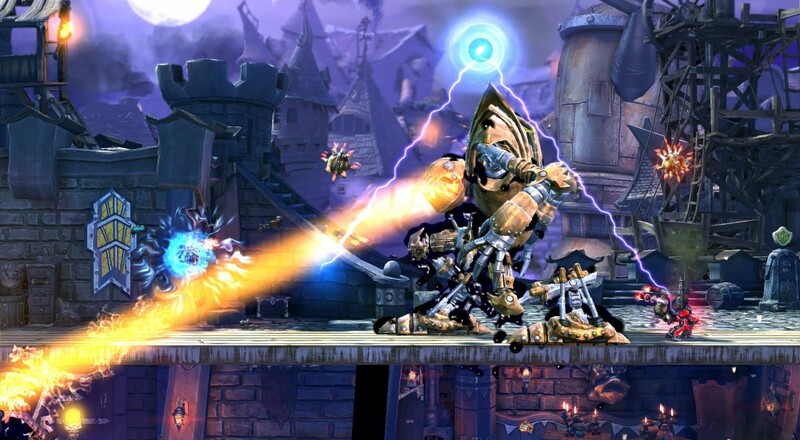 DieselStormers has actually been in development since 2006. The team has tinkered with it off and on in-between paying gigs, making it a bona fide labor of love. After the funding came through in 2014, work surged forward to give the game the full attention it deserved. The story follows the inhabitants of Ravensdale as they take back their city from a rampaging horde of baddies. Just about everything in the game is programmatically generated, from the levels to the enemies, traps, and even the bosses. Weapon drops are randomized as well, so you never really know what's going to happen when you fire up this puppy. Co-op is what has us genuinely excited, as Black Forest didn't mess around when it came to multiplayer. DieselStormers supports couch and online co-op for up to four people, which translates into so much bright and shiny shooting we're not sure our little eyes can handle it. A firm release date hasn't been announced, but you can participate in the Steam Early Access release now if you just can't wait to get your hands on it. Page created in 0.3376 seconds.